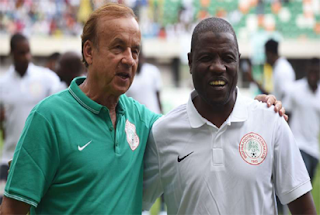 SUPER Eagles coach will be on the stands to watch the Nigeria Federation Cup final this afternoon in Lagos after arriving the country, for the the 2018 FIFA World Cup qualifiers against Algeria November 12 in Uyo, Akwa Ibom. Rohr will discuss strategies for the all important match against Algeria with Nigeria Football Federation before beginning his training secessions on Tuesday morning in Abuja. Assistant coach Salisu Yusuf disclosed that they have received assurances from the players invited that they will report early for the game, which will determine the seriousness of the Super Eagles to qualify for the World Cup after missing out on the Africa Cup of Nations twice in a row. “The players are expected in camp on Sunday evening (today) or latest Monday morning and hopefully we can start a serious training on Monday evening or Tuesday morning,” Yusuf said. Speaking on the chances of the Super Eagles, the former Enyimba FC coach said that both teams are balanced in terms of attacking their strength but the Algerians have weaknesses, which the Eagles will cash on. “We have good players in the attack line just like the Algerians. They are scoring for their various clubs in Europe. We know their weak point and we are going to exploit it. We are very confident the Eagles will carry the day,”Yusuf said.